A great turn-out at a very special meeting. The unique “Many Lamps - One Light” programme took on a melodious note due to a visit by a group of young performers, breaking from their university studies to bring beautiful songs and chants to the group’s latest meeting at Hillside 4 Condos on the afternoon of July 12. 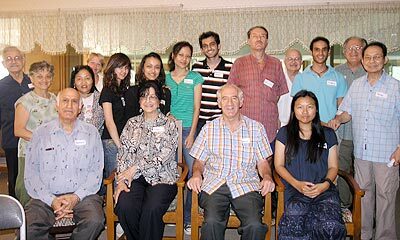 The performers, from South Africa, France and Malaysia, all members of the Baha’i Faith, whose core belief is the essential unity of humanity and its various world religions, are on a 3 week visit to Chiang Mai, during which they will be performing at other venues including at least one of the universities. The “Many Lamps - One Light” programme group have been meeting regularly on the second and fourth Saturdays of each month since November 07, and offer an ideal opportunity for persons who are looking for a spiritually uplifting experience by means of exploring themes through a selection of sacred writings from all the major world religions. There is no “traditional religious service”. Everyone’s participation has always been important and welcome. The only ground rule followed in the very harmonious and friendly atmosphere is that there are absolutely no inferences as to which sacred scripture might be superior to any other. Each is treated equally and the programmes richly illustrate their commonality. Refreshments are served - there is no charge to attend. Suite 209 at Hillside 4 opens at 2 pm for a 2:30 commencement, and all are welcome. As part of the USA Independence Day celebrations, an evening event was held at the USA Consulate on July 2 to commemorate 175 years of Thailand-USA relationships. Invited guests included heads of government departments and prominent businesspeople. 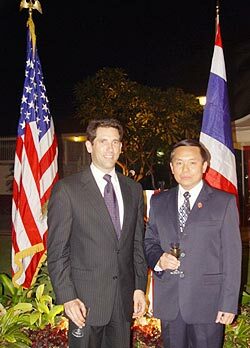 The US Consul Gereral, Michael Morrow, left, and Chuchart Kilapaeng, Deputy Governor of Chiang Mai, at the USA Independence Day celebrations. Remarking that it had been over a year since he took up his position as Consul General, he said that he considered the experience a privilege, and thanked the people of Chiang Mai for making himself and his family feel so welcome. The Thai Royal Anthem was then played, and a toast was raised to Their Majesties, the King and Queen of Thailand. On behalf of Thailand, Chuchart Kilapaeng, Deputy Governor of Chiang Mai, replied that, on behalf of the people of Chiang Mai, he was pleased and honored to celebrate 232 years of American independence and the 175th anniversary of Thai-USA relations. Based on freedom and equality as a family, cooperation in many fields, such as commerce, investment, education, culture and tourism has been achieved. The two countries have also exchanged visits between American leaders and the Thai Royal family. Both the US Ambassador and the Consul play an important role in promoting relations between the two countries. Chuchart then said that he gave best wishes to the people of America, and that he hoped that the relationship between the two countries would continue to grow. Shangri-La GM Elaine Yue welcomes the Expat Group. 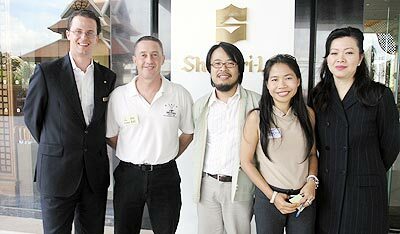 Pictured here are Julian Wipper (F&B), Alan Hall, Thitipol Kanteewong, Duenpen Chaladlam and Elaine Yue. Earlier this month, July 12, the Expat Group held its first meeting at the Shangri-La Hotel having moved form the Chiang Mai Orchid Hotel next to Kad Suan Kaew shopping plaza. On hand to greet members was the general manager, Elaine Yue and the food and beverage director Julian Wipper. The reason for the move was stated as “better facilities including improved car parking and a state-of-the-art sound system,” although at least one member found the echo at the rear of the room at least a little trying. The meeting on July 12 featured Traditional Melodies and Lanna Traditional Music Instruments from Thitipol Kanteewong. Ajarn Thitipol graduated Master of Musicology from Mahidol University and composes new music which uses both traditional and contemporary ideas. His main instrument is the ‘Salaw’ which is a type of fiddle. The Expat Group meets every 2nd and 4th Saturday in the month - on July 26 the guest speaker will be Henrick Peterson. A press conference was held July 11 to announce details of the “Baht for a Better Life” concert to be held on August 30 in the Payorm Room at the Amari Rincome Hotel. It proved to be a press conference with a difference - as singing was the order of the day! Starring in the show will be the ‘Pink Panther’ (alternatively known as Wichai Poonyayant) and his band, supported by the Amari Rincome’s own ‘Daeng Fantastic,’ who recently gave a sell-out concert in Bangkok. Also there will be The Impossible (Vinai Punturak) and Silver (Virut Yootaworn). 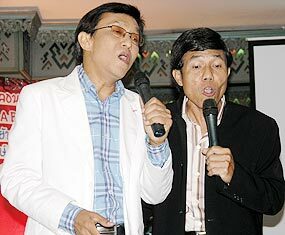 The music will feature English and Thai popular songs old and new. The Pink Panther and Daeng Fantastic entertain the paparazzi. Tickets are 950 baht and include an International Buffet. Drinks are not included in the ticket price. Tables of 10 can be reserved by contacting the Amari Rincome Hotel on 053 221 130. All proceeds from the concert will go to the ‘Baht for a Better Life’ project, an ‘in house’ charity organised by Amari Hotels, Resorts and Spas. Guests staying at any hotel, resort or spa in the Amari chain are encouraged to donate their small change, all of which goes to further the education of children in Thailand. Many guests, of course, do give more and some even commit to providing scholarships for needy children. At present, two different initiatives are supported - the Duang Prateep Foundation and the Amari Schools Project. The Duang Prateep Foundation supports children and their families from an under-privileged area of Bangkok. In this area, poverty prevents the majority of children from completing even basic education. Through the project, children who are especially hardworking and determined to continue their studies can be supported and helped to succeed, despite the odds being against them. The Amari Schools Project uses funds to improve the structures of dilapidated schools and to build and equip new schools in various provinces across Thailand. The New York New Music Ensemble pictured at the master class for students. There is a sense of excitement and anticipation at any concert of contemporary music and never more so when pieces are ‘hot off the press’. 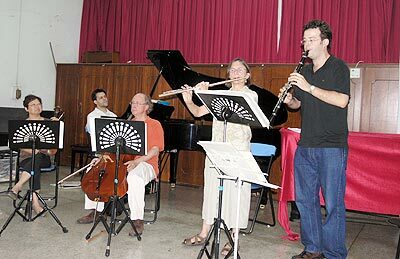 This was the case on Friday July 11 when the Duriyasilp College of Music at Payap University was home to an innovative concert by a quintet from New York. Included in their program were two premieres - both by Thai composers. The remit of the New York group is to play - and often to commission - new or modern music and (as ajarn Bennett Lerner pointed out whilst introducing the musicians) this means music written for us, the audience, whether we are nine or 90, since we are all contemporaries of that music. The vociferous applause from a large crowd suggested a measure of anticipatory agreement with the sentiment. The concert comprised just six works, balanced between the five brilliant performers: two pieces for all forces - piano, cello, violin, clarinet and flute - two for quartet and two for flute, with piano and clarinet respectively. Much of the music was challenging for both players and the audience and stretched the conventional boundaries of the instruments way beyond the norm. It made for an exhilarating evening. The ensemble, which came to Thailand for the Fourth Bangkok Composer’s Festival, held July 16-18, visited Chiang Mai at the invitation of Payap and Lerner and, the afternoon before the concert, gave a master class for students and interested observers at the McCormack campus, based around the music in the concert and helping illustrate the demands made on the various instruments by ‘new’ music. A rapt audience was treated to a sneak preview of Narong Prangcharoen’s quintet Vaya and found in it elements of Thai music which intrigued the musicians, proving that even the most experienced players can make discoveries during a performance. The opening work at the Saisuree Chutikul Music Hall proved to be the most accessible. A vivacious six minute work for all players called Petrouchskates, by the American composer Joan Towers, pays passing tribute to Stravinsky in a mind-blowing cascade of sound which combines a flirtation with the great ballet score and the graceful movements of skaters. This witty composer is famous for her riposte to Copland’s classic Fanfare for the Common Man. Her work is entitled Fanfare for the Uncommon Woman and has been performed world wide by some 500 different orchestras and groups. A happy fate unlikely to be echoed by Chou Wen-Chung’s challenging work Cursive, for flute and piano, written in 1963 when the composer was forty. This makes daunting demands on both players, especially the flautist, as it suggests the hoops and curves of Chinese calligraphy within a virtuoso - and often hauntingly beautiful - work, which demands further hearings to be appreciated. Spiral V1, as the name suggests, is part of a group of pieces by the Cambodian composer Chinary Ung, written for piano, clarinet, violin and cello, which juxtaposed plangent melodies for the string instruments with vital and contrasting music for wind and piano. The composer states that he has drawn from aspects of traditional music from his childhood - music later suppressed by the Khmer Rouge. The Thai compositions, both “first public performances” were for four and five players respectively. Jaba by Narongit Dhamabutra (Great Sadness) was written in memory of the sister of His Majesty the King, Her Royal Highness Princess Galyani Vadhana, who died recently. The work, written for the New York group, celebrates the Princess’ great contribution to the arts in Thailand, especially music, and within three movements blends grace, vivacity and an underlying sense of melancholy. The second 2008 Thai work has recently won its composer a prestigious award in the U.S.A. and is scheduled for a commercial recording later this year. Called Vaya (wind) it is a ten minute work by 35 year old Narong Prangcharoen, who introduced it at the concert, explaining that it reflected the gentle and strong aspects of this element, through shifting pitches and moods. A brilliant performance by the quintet of this work, by the youngest composer represented, rounded off the concert. Esprit Rude Esprit Doux, written by Elliot Carter 44 years ago in celebration of the great composer/conductor Pierre Boulez’ 60th birthday, was by the oldest composer represented, who celebrates his 100th birthday this coming December and is still working steadily. One of the greatest of all American composers, Carter displayed great mastery in the concert’s seemingly most simply textured work. The title suggests rough and smooth breathing and vividly contrasted the qualities of both in a superb work for flute and clarinet. The demands made on the players are formidable, and it was a tribute to both that they made this beautiful piece the highlight of a memorable evening. The performers were Jayn Rosenfeld (flute), Benjamin Fingland (clarinet), Linda Quan (violin), Chris Finkel (cello) and Stephen Gosling (piano). Café Souvannaphoun on Ratchamanka Road, next to Gecko Bookshop, is becoming well known for promoting and supporting emerging artists dealing with contemporary art and photography. Previously, Patcharapong On-Ing held an exhibition there entitled ‘Harmony’. Balz Hammer, proprieter of Café Souvannaphoun, with Tee and photographic artist Assada. Now it’s the turn of a photographic exhibition by Assada Pornananond entitled ‘Spiritual City’. 32 year old Assada, born and bred in Chiang Mai, is an ajarn at the Fine Arts Faculty of the Chiang Mai University, where he teaches 50 students from different faculties. In this exhibition he uses a toy plastic camera because he wants to prove to his students ‘you don’t need to have an expensive equipment or camera to do good work’. All of the photos are black and white and shot in the city - the name gives a big clue that they are mostly either of temples or parts of temples. 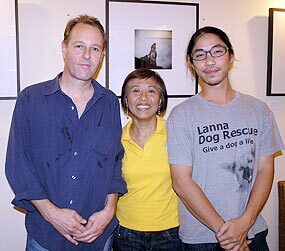 The photos are for sale at 4,000 baht apiece. Assada is an extremely industrious character, holding 3 or 4 exhibitions every year and is well known on the ‘art scene’ in Chiang Mai. The exhibition will run until August 21. Café Souvannaphoun (053 903 781) is open from 5:30 until late, but closed on Sundays. The recently formed Chiang Mai chapter of Soroptimists International met July 12 at the Amari Rincome to further coordinate their Single Mothers Project following the highly successful “Respect - Taking Action in Style” Fashion Show Extraordinaire. The event, staged to celebrate the first year’s anniversary of the new chapter, raised a net amount of over 100,000 baht. At the meeting, it was decided that a number of smaller fundraisers should be organised in order to raise awareness of the project as well as much-needed funds. The aim of the Single Mothers Project at present is to provide ongoing practical and financial support for single mothers who have received the initial one year support package from the Wildflower Home in Chiang Mai. Wildflower provides a safe haven for traumatised young women and their children, who have escaped from desperate, often abusive situations, and gives counselling and training to help the women to recover from their experiences, gain employment and rebuild their lives in a positive manner. Although a relatively new group, with, as a result, limited funds, Chiang Mai’s Soroptimists are committed to supporting single mothers struggling to keep their families together whilst balancing the challenges and demands of the work place and the home. To further these aims, single mothers are offered a structured and long-term support base, reimbursements of medical costs for themselves and their children, micro-loans and long term scholarship donations for a minimum of 6 years if needed. Liaison with employers who support single mothers is an important part of the programme, as is encouraging the women to stay with the employers and create a stable future for themselves. Basic business training is also offered in order to help such women fit in to the work environment. On July 11, Chiang Mai University campus hosted an information, awareness and fundraising event entitled “60 Days after Nargis,” the aims of which were to keep the public and involved NGOs informed of the situation in the affected areas, and to further discuss possible solutions for both emergency relief and long term recovery. A further objective was to foster understanding and awareness regarding the human rights situation brought about by the cyclone’s devastating effects, and to strengthen networks amongst individuals, civil society groups, academics, NGOs and other organisations working in Burma. The day began with an introduction from Dr Chayan Vaddhanaphuti (Faculty of Social Sciences at CMU), who also acted as moderator, followed by a detailed report of the current situation from Amnat Phonmart of the ASEAN Emergency Rapid Assessment Team and a talk by Chaikrit Maachamlong (also from the Faculty of Social Sciences). Nattawadee Duangtadam (Community Development and Civic Empowerment) gave a presentation on community relief initiatives, followed by details of cross border relief provided by Manh and Slai Doug Muang from the Emergency Assistance Team (EAT-Burma). Prior to a break, Preeda Khongpan from the Tsuami Victims Network Team talked about the Tsunami Experience and Nargis Cyclone in Burma. After the break, Sulak Siwalak, former Chairman of Saithierakoses-Nagapradipa Foundation gave a speech on ‘Go Beyond Nationalist History Towards a Greater Understanding and Better Attitude on Burma’. This was followed by numerous speakers discussing the migrant situation in Thailand. In the evening, a fund raising concert took place; artistes included the comedy show by ‘Thee Lay Thee,’ and performances featuring entertainers from the Shan (Tue Pho), Karen (Phanuthat Aphitchanathong), Lanna (Hong Hien Sueb San Lanna) and Molam Lanna (Boon Kak Saa). Joining in the event were artistes from across Thailand and from Burma. During the whole event, from 1 pm until 9 pm, various activities to raise both money and awareness took place, including photo and painting displays, Burmese food, dolls from Nose Udom and T shirts. The Chiang Mai Friends for Nargis Recovery Group, which has to date raised 189,500 baht for victims of the disaster helped enormously with the organising. Urgently needed funds have been sent to grassroots organisations working to assist cyclone victims; however, the damage wrought by Nargis is so widespread and massive that more than one million estimated victims have yet to receive any form of basic aid. If you would like to donate, bank details are as follows: Krung Thai Bank Account; CMU Branch, under the name of CM Friends for Nargis Recovery. Account No 456-0-04854-1. Alternatively there is a donation station at Wat Kum Tao in Chiang Mai.